United World College (UWC) Movement > UWC Nepal > Like Country, Like Young Man? I receive — from a range of people — entreaties for help with United World College (UWC) scholarship applications, which isn’t unusual. But the following private messages from a scholarship candidate takes the cake! He wrote for the first time with a kind of tongue-in-cheek request for help with preparations for the second (interview) stage of the selection process. Of course I refused. 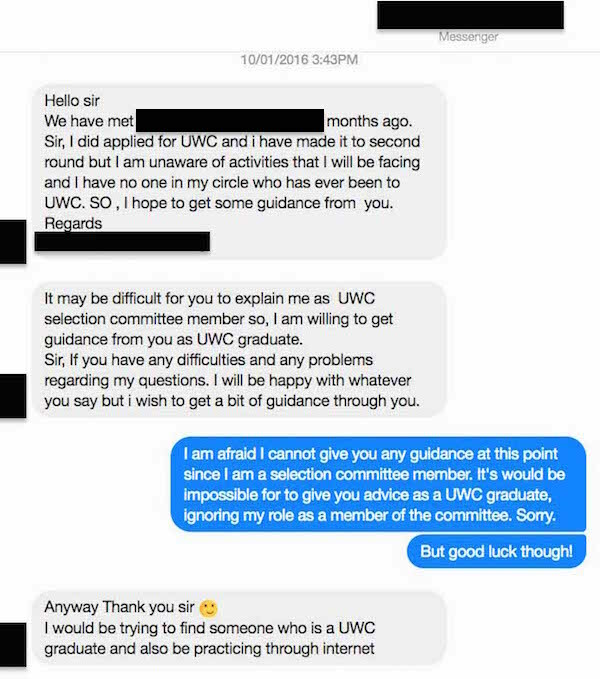 He then came back to me recently with an accusation of unfairness by the UWC Selection Committee, providing others a leg up! He went on to tell me how that reflects poorly on the UWC National Committee, UWC alumni, the organization I run with a friend, and also my person! First the request for help. Next, the PM I received from him a little over two week ago in which he accuses us (including COMMITTED) of an unfair practice! Unless, he is talking about someone who, in spite of ranking much lower, received — and accepted — an offer because his/her family could afford the costs. Most UWC offers are NOT full-scholarships, unfortunately. 🙁 Which means, not qualifying for a full-scholarship, even if ranked high in the selection, a candidate might not end up with an offer because the outlay was beyond the means of the family. The offer then can end up in the lap of someone ranked lower but from a wealthier family! Sometimes, candidate(s) who didn’t even rank in the top 10 or even 20 might get to go because his/her family could afford the fees none of the others’ family could! As unfortunate as it is, Nepal UWC National Committee does NOT have the necessary funds to support candidates who, according to the Selection Committee, might be better suited for and/or deserving of a UWC placement. What I am pretty sure of is that he is pretty clueless about the irony in all this. There he was, actively seeking my assistance with the process AND would have relished getting an edge, an advantage, over other applicants. And yet, long after the process ended, he complained about the appearance of others having been successful in getting an edge over applicants like him — by going through a “separate selection process,” information about which, according to him, not everyone was privy to! Looks like, as long as he had been on the receiving end of an unfair advantage, he would have been fine. Just that others can’t have an unfair advantage over him. How does a young man like him grow up to be so, complaining about others getting what he could not get through subterfuge? The answer: our culture! His lapses in thinking, reasoning and attitude is mostly a result of him being a product of the culture and society of Nepal, a failed and dysfunctional State. What guides and rules the behaviors of a large number of people from in the highest positions in all three branches of the government to the lowliest of civil servants in government offices all over the country to even average Joes in the streets, are generally not rules, laws and ethics. Instead, cronyism, nepotism, corruption rules. Laws apply mostly to those without “source-fource”, the poor and unconnected for instance. In the peculiar social and cultural environment of Nepal, if one is able to get a leg up with help from someone “inside,” someone in the know, someone connected, then you are commended for it, not denounced! That’s partly why many in the country are brazen about seeking unfair advantages over fellow competitors, even using subterfuge. This young student, not surprisingly, appears to be no exception. The other issue with his PM of Aug. 5 is that he does NOT have some of the most basic facts straight. The young man was a student at one of the many schools I went and spoke at about my life and UWC scholarships to try to inspire them to dream big and shoot for the moon! In the presentations, I invariably talked about my reasons for returning to Nepal, one of which was to make a difference in the lives of the next generation of Nepalese youngsters from backgrounds similar to mine and how I have been trying to do that by co-running COMMITTED and volunteering for UWC Nepal. (For examples of videos or blog posts of presentations, click here, here, here or here.) But clearly, he is hopelessly confused about me, COMMITTED, and my voluntary work as a member of the (UWC Nepal) Selection Committee. Of course, COMMITTED has nothing to do with disseminating information about the scholarships, let alone with the selection of candidates. Sure, the Selection Committee has used COMMITTED’s office space for the selection process, just as we have Budhanilkantha School, Teach For Nepal’s office, Open Learning Exchange’s Office, Sano Paila’s office to name some others! Sure, I happen to be one of the Directors of COMMITTED. Sure, the Coordinator of the Selection Committee happens to be COMMITTED’s Chairman etc. What’s more, this year, COMMITTED’s office is the drop off point for the application forms! Still though, apart from that, COMMITTED has not been — and is not in any way — responsible for, or involved in, disseminating information about the UWC or the scholarship programs, forget our involvement in the actual selection of the scholars. I am involved in all that in my capacity as a former-UWCer and volunteer for the Selection Committee! If you want to know why I do what I do for the movement, read My Potholed Road to The UWC. 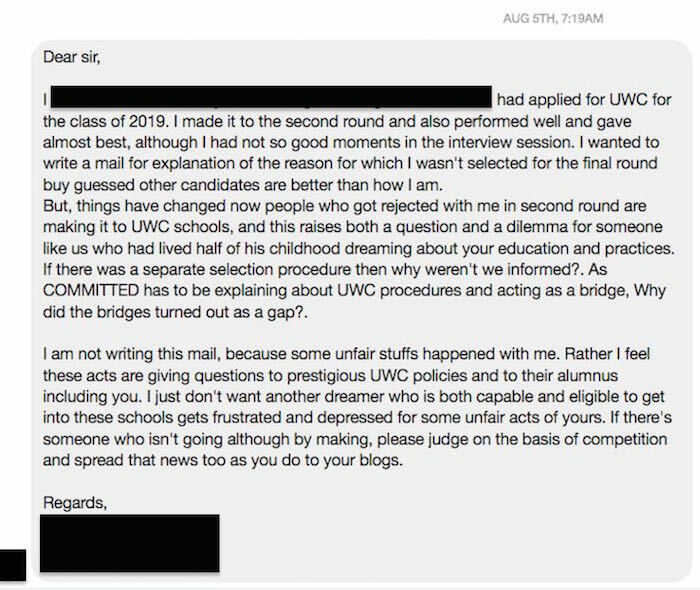 Towards the end, he says that he is NOT complaining because he suffered but rather to prevent “another dreamer” suffering from similar lapses in the selection process on COMMITTED’s, mine and other UWC Alumni’s part! How noble of him, but how ironic as well, again! Would he have raised these issues had I helped him? (He doesn’t say if he managed to get help from another UWCer.) Probably not, and that’s what’s sad, and unfortunate, about him…and the country!